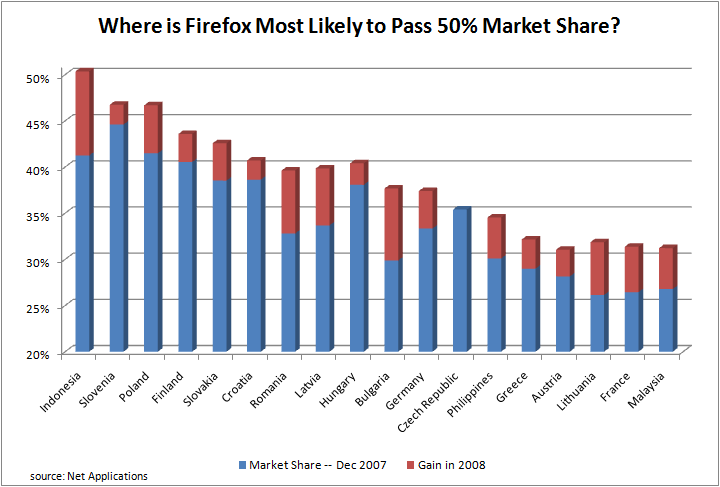 Where will Firefox Reach 50% Market Share? On the heels of this week’s announcement that Firefox recently surpassed 50% market share in Indonesia, we thought it would be interesting to look at what other regions are also nearing this amazing milestone. Thanks to Net Applications, we’re able to share this data, which is typically only available via a subscription to their service. In the chart below, you’ll see which countries are next in line for passing the 50% mark and the degree to which each region has been growing in 2008. Please click on the image for a full view. Net Applications shows that Firefox is most likely to soon surpass the 50% mark in Slovenia, Poland, and Finland – with 48%, 47%, and 45% June market share numbers, respectively. What has Xiti, another provider of market share information, had to say on this subject? According to their latest report, Firefox market share is highest in Finland, Poland, and Slovenia – with 46%, 44% and 44% March market share numbers, respectively. Given how eerily similar these two distinct data sets are , it seems as though the data presented in the chart above should, at the very least, be directionally true… giving our communities one more reason to celebrate. I’m still wondering why Croatia doesn’t have a localized version. Looks like Poland will beat Slovenia, as their growth is much higher. (1) In the middle, Romania and Bulgaria have had large increases, which if it keeps up will put them near the top in a year.